Commodore Warwick commenced his sea-going career at the age of 15 as a cadet at the pre-sea training ship HMS Conway in North Wales. He became an indentured apprentice two years later on the cargo ships of the Port Line whose principal area of trade was Australia and New Zealand. After obtaining his Second Mate's Certificate in 1961, Commodore Warwick spent the next several years sailing with various companies to gain experience on different types of ships. It was his time as Fourth Officer on the Royal Mail cruise liner RMS Andes that left him with the desire to specialize eventually in passenger shipping. In 1967 he became Chief Officer of a cargo ship, and by 1968 he had obtained his Master's Ticket. A few years later, in 1970, he joined the Cunard Line and was appointed to the Carmania as a junior officer. Since then he has served in various ranks on the QE2, Cunard Adventurer, Cunard Countess, Cunard Princess and Crown Dynasty. 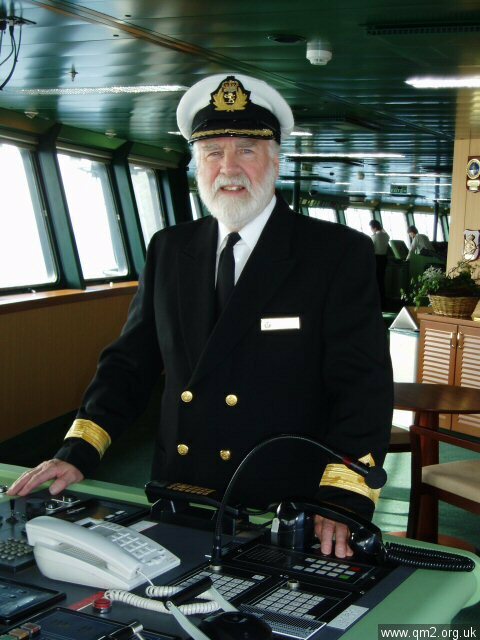 His first command was of the Cunard Princess when she was sailing in Alaskan waters in 1986. He was Navigator on the first world cruise of the QE2 in 1975 and Chief Officer for a number of years, which included the period when the liner was requisitioned by the British Government for service in the Falkland Campaign. Captain Warwick was first appointed to the command of the Queen Elizabeth 2 in July 1990, and was Master during the visit of Her Majesty Queen Elizabeth II and His Royal Highness the Duke of Edinburgh, on the occasion of Cunard Line's 150th anniversary celebrations at Spithead. 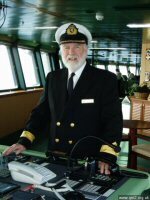 At this point in his career he made Cunard Line history by sailing in command of the same ship as his father, the late Commodore William E Warwick CBE RD RNR who was the first Master of the QE2 before he retired in 1972. In June 1996, Captain Warwick was appointed to the position of Marine Superintendent of the Cunard Line fleet and then to the permanent command of the Queen Elizabeth 2 on 1 October 1997. One of Captain Warwick's most memorable events was solemnizing his daughter's marriage on board the QE2 in Boston harbour on 4 October 2001. The ceremony was the first legal marriage in living memory carried out by a Cunard Master on board any of the company's ships. During his association with the QE2 he originated the first authoritative book about the liner which was published in 1985. The work was revised and updated by Captain Warwick in 1994 and again in 1999. 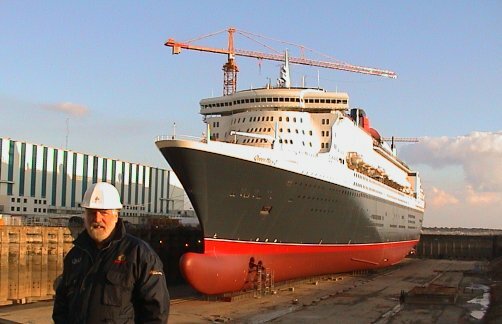 On 4 July 2002, at the Keel Laying for Queen Mary 2, Cunard's President and Chief Operating Officer Pam Conover, announced the appointment of Captain Warwick as Master Designate of Queen Mary 2, the largest passenger liner in the world and the new Cunard flagship. On 26 December 2003 Captain Warwick was made Commodore Warwick. Commodore Warwick will take QM2 out on her maiden voyage on 12 January 2004, just as his father (Commodore Bil Warwick) did with QE2 on 2 May 1969. He is a Younger Brother of Trinity House, a member of the Honourable Company of Master Mariners, a founder member and Fellow of the Nautical Institute, Governor of the Marine Society and a retired officer of the British Royal Naval Reserve. He has a son and a daughter and lives with his wife, Kim, in Somerset. His interests include property restoration, maritime history, genealogy and researching the history of Cunard Line Captains since the company was founded in 1839. His interest in the Titanic led to a visit in August 2001 by deep-sea submersible to the wreck which lies at a depth of two and a half miles below the surface of the North Atlantic Ocean.